This is the second royal mint built in Potosí. It dates from the second half of the 18th century and replaces an earlier, smaller structure. The façade of the building, seen here, suggests the enormous scale of the building which, when completed, filled several blocks of Potosí’s urban center. A sense of the building’s expanse is suggested by this view down the street. 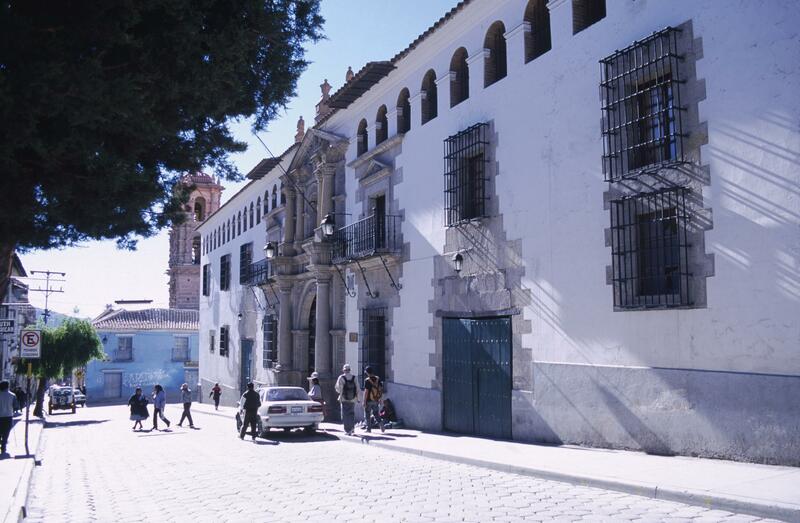 The mint’s façade faces the street that runs into the main plaza of Potosí which is to the right, outside the photograph. This main entrance into the central courtyard of the royal mint is the only architecturally sculpted form of the façade. The window grilles are modern ones, although in the 18th century, the Casa de la Moneda would have been heavily guarded, as great amounts of silver were stored within. 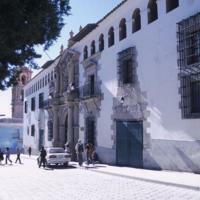 This was the second mint building in Potosí, a replacement for the 16th-century one founded under Viceroy Francisco de Toledo. Its construction proved to be enormously expensive—in part, because of its extraordinary scale. Today, the mint buildings are a museum. In the 18th century, along with colonial officials, Andeans, mestizos, Africans and African-Americans would have worked in the mint. An equally diverse population would have passed the building, which sat off the main plaza, every day on the way to markets, businesses, and church. Bayón, Damián and Murillo Marx, 1990. History of South American Colonial Art and Architecture: Spanish South America and Brazil. Barcelona: Ediciones Polígrafa. Cunietti-Ferrando, Arnaldo J. 1995. Historia de la Real Casa de Moneda de Potosí durante la dominación hispánica, 1573-1825. Buenos Aires: Pellegrin. Fuertes López, José Antonio. 1993. La Casa Real de Moneda. Potosí, Bolivia. Mesa, José de and Teresa Gisbert. 1992. Monumentos de Bolivia. La Paz: Embajada de España en Bolivia. Mesa, José de and Teresa Gisbert. 1970. Bolivia: monumentos históricos y arqueológicos. Mexico City: Pan American Institute of Geography and History.